(Bridgewater, N.J., Feb. 8, 2017) – The Somerset Patriots have announced the re-signing of right-handed pitcher Kyler Newby for the 2017 season. Newby enters his fourth season with the Somerset Patriots and fourth in the Atlantic League. Last year, Newby’s 2.48 ERA led all Somerset pitchers (minimum of 50.0 innings pitched). Additionally, he finished second on the team in appearances (52) and struck out 62 batters against just 12 walks in 50.2 innings of work. In 2015, the Las Vegas, Nevada native went 8-4 with a 4.09 ERA and two saves over 49 relief appearances. Additionally, Newby tossed two shutout innings over three appearances during the postseason en route to an Atlantic League championship. Newby appeared in 11 games with the Somerset Patriots in 2014, tossing 11 innings of shutout relief while recording one save. He later had his contract purchased by the Los Angeles Angels of Anaheim and was assigned to Triple-A Salt Lake, where he carried a 3.98 ERA over 30 appearances (two starts). 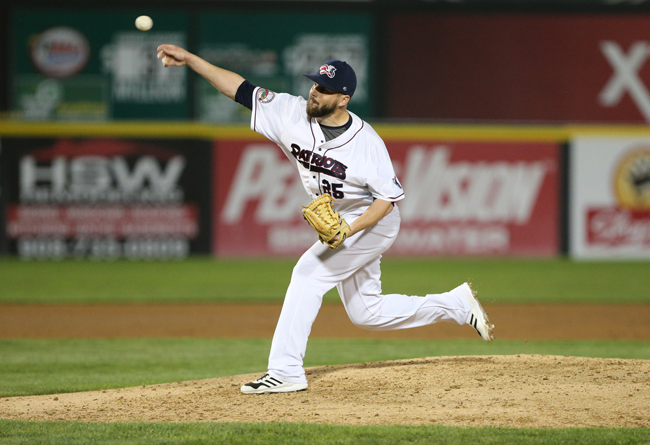 Newby owns a 9-6 record with a 3.01 ERA and three saves over 116 relief appearances in his three seasons with the Somerset Patriots. The Mesa Community College alum has 12 years of service across the minor leagues, including stints in the Arizona Diamondbacks, Baltimore Orioles, Oakland Athletics and Angels organizations. He reached Triple-A in all four organizations: 2011, 2012, 2013 and 2014, respectively. Newby also received a call up to the Major Leagues with Arizona in 2011, but did not end up pitching in a game. The 2004 Diamondbacks draft pick owns a 48-34 record with a 3.17 ERA, 66 saves and 770 strikeouts over 713.1 innings pitched in 452 career appearances (31 starts).